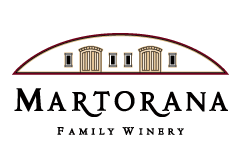 Martorana Family Winery was created in the spirit of celebration. That spirit embraces the joy of life and the ability to live in the moment. It is in these moments that we pause, put life into perspective, and we are reminded of what is truly important: the people we love. Tasting Room - We are open daily for tasting from 11:00 to 5:00. Please allow 45 minutes for a complete tasting experience. Groups - We like to provide individual attention to all of our guests. Groups of 6 or more are welcome with advanced reservation and email confirmation with our tasting room staff. Please email info@martoranafamilywinery.com or call (707) 433-1909 to inquire about group tasting availability. Picnic Area - Guests may bring their own food and enjoy picnicking at our tables in the vineyard or by the creek; a purchase of at least one bottle of wine for every two guests is required. For groups of 6 guests or more a reservation is needed. Please note that no outside alcoholic beverages are permitted at Martorana. Picnic Basket Lunches - Make it easy and call ahead to order a customized Picnic Basket and have your lunch ready when you arrive at Martorana! A 2 day advance notice is required to arrange picnic baskets. Picnic lunch experiences are $45 per person, or $35 per person for current Martorana Club Members. Please email info@martoranafamilywinery.com or call (707) 433-1909 to arrange your picnic in advance. Bocce Ball Courts - sip wine and play a few rounds of bocce. Our courts are first-come first-served for customers and wine club members. Creek Access - enjoy a glass of wine while relaxing right on Dry Creek. Handicap Accessible - our picnic area, restroom, and tasting room are all handicap accessible. Handicap accessible parking is available in our parking area. Dog Friendly - trained, friendly dogs are always welcome at Martorana! Please keep your dog on a leash during your visit.